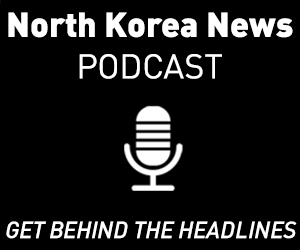 Many North Korean defectors remember the late 1980s as a time when change was in the air. On the outside, their society looked solid as a rock, yet the public feeling was that this rock was going to turn into an avalanche pretty soon. 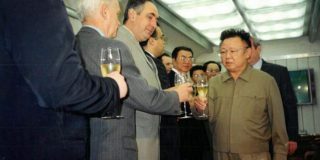 The situation in the Soviet Union was a primary trigger forcing North Koreans to doubt the stability of their society. 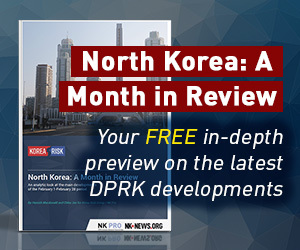 After cooling their friendship with rapidly developing “revisionist” China, the DPRK reactivated relations with their old Soviet partner, and many North Koreans began to visit the USSR for business or study. These visits enabled them to earn sums of money which by North Korean standards were astronomic; allowing them to buy and send home lucrative commodities like fridges and fans. While visiting the USSR, North Koreans did not fail to notice that their brethren in socialism were going in an odd direction. Soviet society had begun to resemble the decadent West as portrayed in the North Korean films: with young people wearing denim, sporting eccentric hairstyles, and playing rock music. 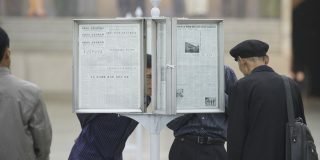 Nobody took Communism seriously anymore: jokes about the grave men in the Politburo were common, and in 1985, these changes took official shape in the form of Gorbachev’s slogans of perestroika (restructuring) and glasnost (openness). Back at home, the Great Leader Kim Il Sung was not getting younger, and like his face, the economic situation in the DPRK was slowly deteriorating. Kids in school stopped receiving cow milk, instead receiving poor-tasting soymilk; the share of everyday grains distributed by the state consisted mostly of corn. Meanwhile, state barbershops performed strictly designated hairstyles which traced back to the 1950s. Social frustration was piling up though remained mute; as always, the strata particularly susceptible to political doubt was educated youth in the cities. The country’s aging ideological shepherds noticed the warning signals. However, having little experience with alternative social models, they reacted in the predictable way that adults usually do when confronted by adolescent rebellion: they increased the volume and frequency of ideological indoctrination, and hoped that cinema would be the medium that would save the country from social liberalism. These expectations were not groundless. In comparison to DPRK society, which seemed to have frozen in time, official North Korean cinema developed in a rather dynamic way. Its major themes remained unchanged: the good characters were still overfulfilling production plans, volunteering to work in godforsaken holes, or dying fighting an unspecified enemy. But the films of the 1980s delivered these evergreen themes in unusually personal ways. No more would a misstepping hero be subjected to harsh public self-criticism sessions: instead, his consciousness was awakened after the soft admonition of a friend, after reading a wise book, or as a result of his own inner spiritual growth. An even more attractive innovation was romance. Love was portrayed as a reward to the good fellows; bad boys were punished by losing love. What’s more, the lovers were attractive. These films were popular, which North Korean ideologists used for political purposes: the new films were to remind impertinent youngsters how grateful they should be to live under the care of the Great Leader, who had once freed the Korean people from the colonial and class exploitation. 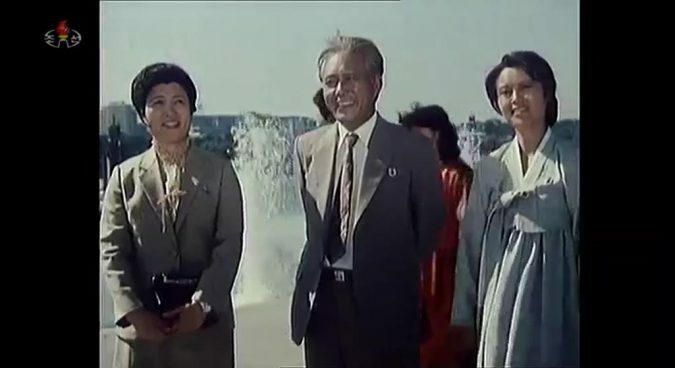 One of such films, “The right for life” (삶의 권리) was produced in 1988 and employed a range of North Korean celebrities. The two principal female roles were played by O Mi Ran and Kong Yeong Lyeol, two beauties of the North Korean screen who had just starred in the popular film “Broad Bellflower” (도라지꽃)(1987). The male lead performed the merited artist Kwak Meyong Seo. He was less talented and popular, but having starred in several politically important films had made him a big name. The choice of these famous actors was aimed at ensuring the proper delivery of the necessary propaganda messages. The plot of “The right for life” is foolproof as well. A young journalist, Cheong Cheol (정철), played by the handsome popular actor Ri Yeong Nam (리영남) fails to write a good “educational article” adequately praising the DPRK. The article is stale and unimaginative, and the chief editor considers the reason for Cheong Cheol’s failure to be his lack of knowledge about Korea’s past. In order to get such knowledge first hand, the editor sends Cheong Cheol to a rural area to meet with an old man called Kim In Deok, who happily leads a collective farm in his village. The old peasant then reveals a shocking truth about his village’s colonial past to the young journalist. (Typically for North Korean cinema, the story is delivered in a lengthy flashback). Stricken by this story, Cheong Cheol cannot sleep at night and rewrites the failed article. The result deeply impresses the editor and moves Cheong Cheol’s mother to tears. 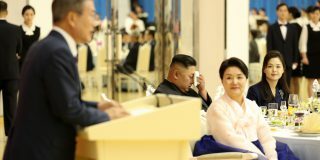 She invites the old peasant and his wife to visit Pyongyang. In many aspects, the film follows the more relaxed mood of the 1980s. Writing a “stale” article on a political theme results in a mild reprimand of the hero; the young journalist humbly admits his mistake and is eager to correct it. His pretty girlfriend inspires him to work hard; the film ends with the characteristically sugary visions of smiling characters. At the same time, the central theme of the film, the colonial past, brings the viewer back to the earlier works of North Korean cinema. In fact, the very assumption that there would be something about the “awful past of colonial Korea” that a Pyongyang journalist would not be aware of is quite unbelievable. In the 1988, North Korean society was virtually soaked in such information. 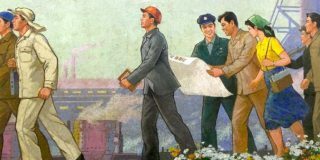 Official culture had developed a highly detailed meta-narrative of the past, and the North Korean leadership, which built its legitimacy upon the idea of having saved the Korean people from Japanese exploitation, actively promoted it. This meta-narrative largely followed the traditions of the progressive literature of colonial Korea, and the ultimate aim of such literature was not to ignite social hatred but persuade the educated audience that Korean peasants had been humiliated and that such treatment should be stopped. This meta-narrative was based on real, if sometimes exaggerated, bitter memories and counted among its masterpieces not only pompous “revolutionary operas” but more intimate, heartwarming works such as the films “My home village” (내 고향) (1949) and “The Son of Earth” (대지의 아들)(1961-1963). These earlier works focused on the realistic portrayal of the deplorable life of peasants in colonial Korea who had lost their land at the hands of owners of large land properties and turned into tenants devoid of basic human rights. “The Son of Earth” centers on the story of Eyon Min, played by the-then rising star of North Korean cinema Eom Kil Seong (엄길성). The young actor convincingly plays a hardworking Korean peasant with a heart of gold, who is helpless before the cruel power of the big land property system. Eyon Min loses his parents in early childhood and is forced to work as a slave in his landlord’s house to repay the debts of his deceased father. 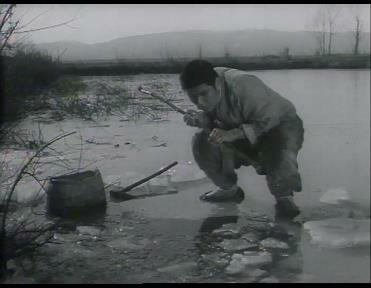 The audience of “The son of Earth” would have swallowed lumps in their throats watching one episode, in which Eyon Min goes winter fishing, hoping to catch a carp and make a healthy soup for the sickly father of Keun Me, his bride, the man who had been his substitute father during his parentless childhood. After long hours of fishing in the ice hole, Eyon Min’s efforts are rewarded, and he happily runs home with his catch. Keun Ne’s father expresses his gratitude, yet in secret, he brings the precious carp to butter up his landlord, in the hope that he will allow them to work on his land yet another year. The young peasant finds his fish in the landlord’s kitchen, and he bitterly cries about his failure to change the lives of his loved ones. The bribe soon proves to be in vain: far from being grateful for the carp, the landlord takes the land from Eyeon Min’s family. Moreover, in order to cover up a drunken murder by his son, the landowner tricks the illiterate Eyon Min into signing a false confession with the promise that it would save Keun Ne from being sold for debts. Eyon Min goes to prison, and Keun Ne is nonetheless sold to a Japanese factory. Viewers in the 1960s who had experienced the colonial period easily recognized these sad twists in the protagonist’s fate. The sufferings of Eom Kil Seong’s character made every Korean’s heart swell with empathy, making him a favorite actor. 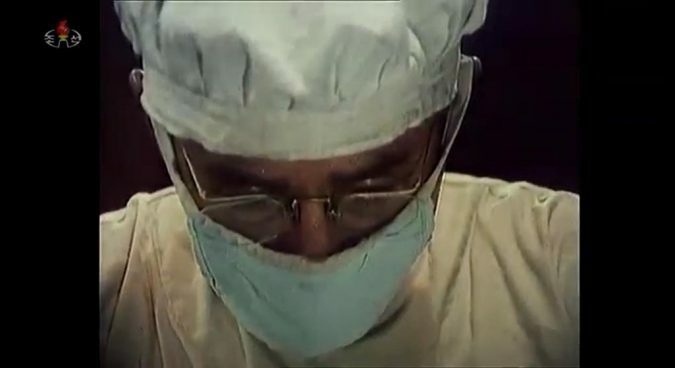 To the authors of “The right for life” in 1988, however, such woes seem too bland, so they resorted to overdramatic, exaggerated horror, which piled one on top of the other like a bad dream. In “The right for life”, we see two young peasant couples: In Deok (played by the merited actor Kwak Meyong Seo) and Po Geum (played by the merited actress O Mi Ran), and In Deok’s friend Yeong Se (played by Reo Yong Gu) and In Deok’s sister Eum Cheon (played by Kong Yeong Reol). In the film, Po Geum’s father is tricked by his landlord into selling her as a wife to his mentally retarded son. When he recognizes the truth, he collapses and dies of shock. 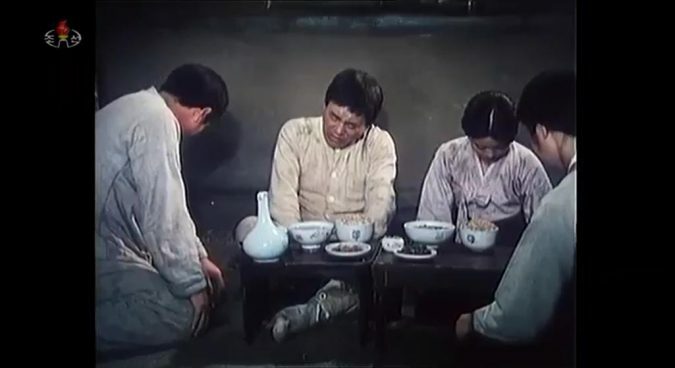 In the landlord’s house, Po Geum is beaten and humiliated and forced to work as a house slave. 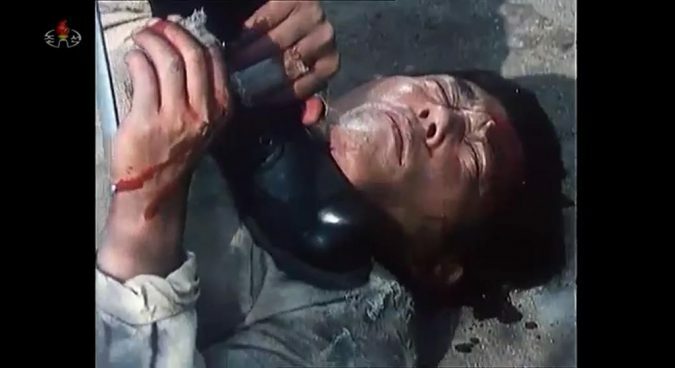 When In Deok tries to protect her, he is beaten unconscious by the Japanese policeman. Eum Cheon organizes a secret wedding for her brother and Po Geum, but the feast is discovered and the participants are severely beaten. To earn money for Po Geum’s freedom, Eun Cheon follows the cunning advice of the policeman and sells her body to the Japanese medical institute. Yet, the Japanese doctors underpay her, Po Geum stays with the landlord, and Eun Cheon dies during an unspecified medical experiment. After finding out that Po Geum is pregnant, the landlord tries to force her to drink abortion-inducing poison, yet In Deok saves her and the unborn baby. He kills the landlord and goes to prison. Po Geum then catches an infectious disease and, instead of getting medical help, is sent to a distant island to die. While she lies unconscious, her baby is beaten to death and thrown into the sea. The Japanese colonial powers were often cruel to Koreans, and they were involved in the infamous practice of medical experiments on living people in POW camps. Yet, medical experiments were almost never conducted on the living citizens of the empire, which Koreans were at the time. 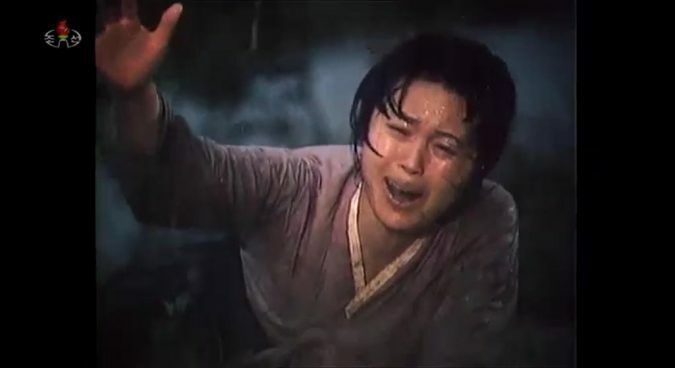 In the eyes of filmmakers, however, visions of eerily flashing and clinking medical instruments at the hands of the Japanese “doctor Evils” bending over the helpless prostrated body of a Korean gir are emotionally irresistible. Marrying Po Geum to a mentally disabled son of the landlord is another odd storyline. The more puritanical approach of North Korean cinema excluded the possibility of the girl’s being used as a concubine for the boy or the landlord; instead, the only goal of the landlord’s devilish plan is to get free labor. Yet, mental impediment is a particular stigma in North Korean culture, and the filmmakers happily press this button. The seed of the landlord should be an ugly degenerate; the pretty peasant girl should be forced to marry a dribbling idiot; her father should die of the shock at such mésalliance. Po Geum’s seeming major job responsibility in the landlord’s house is pulling heavy carts, and this begs the question: why? Why would a landlord, whose house is full of slaves, horses, and oxen use a girl with such negligible muscle mass as draft force? Exploitation must have economic sense, and what we see in the film is more about the personal perversions of the master. Putting aside the historical inaccuracy and implausibility of each case, this hodge-podge of the characters’ miseries are remarkable in their extremity. The incessantly beaten peasants, flowing blood, sold girls, mentally retarded kid-husbands, killer doctors, forced abortions, drowned babies – all these flow out as if from a Pandora’s box. This concentration of horrors is based around one central idea: pre-Kim Il Sung Korea was a land of dreadfulness: only liberation stops the gloom and doom; Po Geum survives and lives happily ever after with In Deok. The very intensiveness and implausibility of these ghost stories show that North Korean propagandists were on edge: by the late 1980s, the theme of colonial exploitation had apparently depleted its propaganda potential. It was all about a bygone era, too far away and irrelevant, and it failed to serve as a scary reminder to younger North Koreans of what their life could be like without Kim Il Sung. Colonial horrors failed to distract North Koreans from their own lives, full of unresolved and increasingly intensified problems. Luckily for North Korean propagandists, the coming era of “arduous march” would soon provide them with fresher and more impressive scarecrows.